Money Metals customers know the importance of protecting their wealth from the ravages of inflation. Building a precious metals holding is one vital step. Securing that holding is another. Storing your precious metals in the ultra-secure Money Metals Depository is inexpensive and affordable. We offer first-class service – including convenience, security, and savings on the cost to ship and insure your metals – at an economy price. 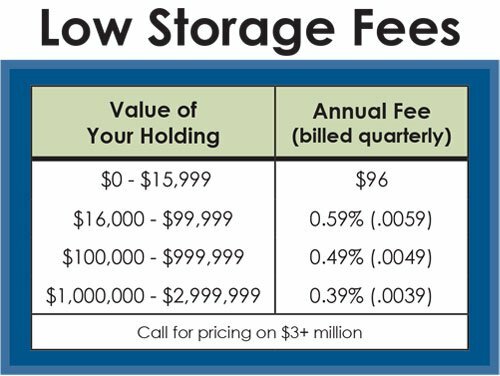 Home storage can be stressful for some investors. Many customers want to hold physical metals in an IRA, which requires third party storage. Large quantities of silver are heavy to handle. Very large holdings always demand extra attention to security. A depository building custom-built to Money Metals specifications, armored in thick steel and hardened concrete. Our facility uses 24-hour monitoring and the latest security protocols. Located in low-crime Eagle, Idaho, with the county sheriff's office located on the second floor. Money Metals Depository contents are fully insured by Lloyd's of London. All metals stored in your account are fully segregated and are never commingled with any other customer's holding, or our own. We are totally removed from any bank, Wall Street, and Washington, DC. You'll never pay a dime to ship and insure when you order from Money Metals Exchange and elect to store your metal with Money Metals Depository. There is also never any cost to ship and insure when you sell precious metals stored with Money Metals Depository to Money Metals Exchange. Third-party storage makes sense when it comes to precious metals IRAs. IRS rules require the assets in retirement accounts be held by a third party, but that does not mean investors are stuck with paper. You can buy physical gold bullion and silver bullion inside your IRA and utilize segregated storage at Money Metals Depository. You may be surprised to find that our white-glove secure storage services come at costs comparable to those charged by a precious metals ETF such as SLV or GLD – but without their counterparty risks and other dangers. It takes just a couple of minutes to set up your account. Then simply make a purchase and choose delivery to your depository account. Or ship metal you already own to be stored securely by us. That's it. We'll safeguard and fully insure your valuable holding in our state-of-the-art maximum security vault. Some depositories play games with customers' assets – pooled accounts, unallocated storage, and "re-hypothecation" of customer holdings (which has been called "the Next Major Investment Disaster"). Money Metals has never done these things, and never will; we do storage the right way – fully segregated, fully insured, never commingled, and never used as collateral. Your metal is held in true bailment and remains your sole property at all times. For more information and disclosures, please visit this page. We guarantee customer holdings are properly secured in our vault. In fact, customers can arrange a look for themselves – right from home. On request, we will schedule a viewing of your holding by video. Your sealed holding will be placed on a table, unpacked and displayed, and then resealed – ready to return to storage (limit once per year; modest viewing fees apply). Our online tools and account notification procedures give you complete transparency into your holdings at all times. You can easily add metals to your account, sell your holdings, ship in, or ship out right from our secure portal. And holdings at Money Metals Depository are audited internally each week and by a third party each year. If you need storage for any portion of your metals stockpile, take advantage of the most secure and convenient option available anywhere. Just call us at 1-800-800-1865 or visit MoneyMetals.com/depository to get started.